Despite the size of your organization and whatever other features of your need on your website. WordPress is the best solution that can help you build your charity website. Charity websites are particularly seeking those people who are willing to do some charity work for the community. The role of these websites is to reach out to the crowd that wants to contribute to the community. Mostly, these charity websites are targeted for the survivors of some natural disaster, man-made disaster, or any needy person of the society. WordPress is the best tool that you can leverage by building a stunning and robust Charity Website. You can easily setup your website and at a minimal cost. WordPress is capable of building any type of website you want. In your case, it is the charity website. So, what you need on your website is a concern that can eat you up in no time. Today, by the means of this post, I will tell you all the things that you need to know about the Charity website. All the features, all the pros, and all the other feature oriented aspects. There are few elements that make a charity website good or poor. Here in this section, I will disclose the elements that make your charity website good in every aspect whether it is for the user or for the owner. Every successful Charity website has a dedicated Mission of their own. That mission is quoted with a unique title that will make it look attractive and easy to understand for all kinds of people. The main focus of a charity website is to get help for the people and give it to the one that needs it. But the base question still remains that, how people will help if you don’t show them the clear path!!! So, a good charity website always possesses a clear set of instruction about how your viewer can help. Also, you must make sure that the navigation of your website is easy and without any confusion. A good Charity website always has the genuine photographs of the people that they probe their sponsors to help. So, make sure that you have the images of the people you want your sponsors to donate for. This will make your website genuine and trustworthy as well. All the top charity website give their visitors an option to donate to them online. They do that by the means of a donate button. So, always remember to put a donate button. This button is basically your CTA button, so, you know where to put the button on the web page. Most of you might get confused with this point and the other that is at the top. However, they have the same difference as a goal and a purpose has. Your charity website must state their charity goal. Now, you need to understand that you cannot have a funding goal just once. You will change the scenario and then you will move ahead until you made a better society. Need to build a Non-profit website? Hire WordPress developers for just $15/hr! 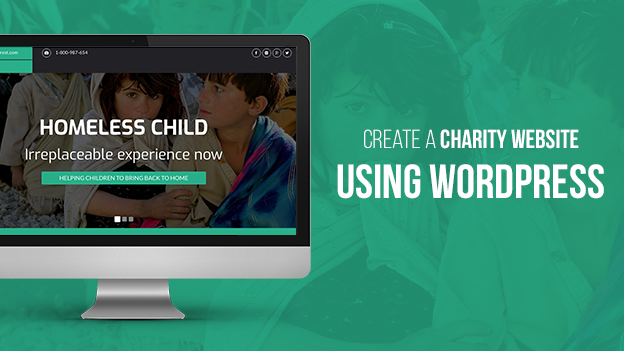 Why Choose WordPress to Create Charity Website? The biggest question that might be circling around your head would be, WHY WORDPRESS!!! I have pretty strong reasons for that. Let’s have a look on some of those reasons that will help you make your decision. WordPress is very flexible and can be used to build almost any kind of website. Plugins can be installed that give additional functionality and make it invaluable for your organization. WordPress has a very active community of users and developers committed to its development. New versions come out regularly and bring new useful features and improvements, as well as ensuring it stays safe and secure. You can download and install WordPress for nothing and for charities that are clearly a good thing. However, what about the cost of hosting it, installing it and the staff time spent learning to use it? Good news is it’s quick and easy for a web designer to install, and easy for you to learn. You can easily change the look and style of your website using what’s called a Theme. Premium i.e. paid-for themes often have better options for customization and more features. They are usually inexpensive and can save you a great deal of time and money when developing a website. The quality of coding of both free and premium themes can be variable, so it’s wise to check out the reviews and get a professional developer to give you a second opinion before you go ahead. If you require very specific functionality or have complex branding, you may need to commission a web developer to create a theme to match your organization’s branding and include those features you really need. We Offer Custom WordPress Development Services to help you Creates a Unique Brand Image! NGOs that want to make a professional impression and raise money need a site that will inspire confidence and create interest. Like any great website, a non-profit version should be easy to navigate, user-friendly, and as visually appealing as possible. Most things in this world just don’t get done without money. So it makes sense that you might be aiming to raise some funds in order to make a difference. WordPress is the best thing that anyone can have if they want a robust and attractive Donate Button. There are WordPress plugins that can help you to extend this function. It will use your Paypal dashboard account and accepts payments from any major credit card or Paypal account. You can even add incentives by sharing info like how many people have donated, social activity statuses, and deadlines. You might be happily surprised how many people are willing to give their time to a cause, even if they don’t have the financial resources to donate. If spreading awareness and recruiting volunteers is on your list of priorities, then WordPress has a solution for you. Plugins that can help you to send the beautiful and intruding newsletter. This way your sponsor can easily catch up with you in every hour of need. Your NGO can only benefit from more exposure – and social media is the perfect platform. Any and all social channels your organization has an account with can be directly linked to on your WordPress site. Facebook, Twitter, Google+, Youtube – you name it – the options are almost endless. You can even take it a step further by adding a plugin that focuses on specific aspects of social networks that let site visitors share your content on their own Facebook timelines. Whichever plugin you choose, make sure they are placed in your fixed header so that no matter what page of your site someone may be on, they can always see it. If your nonprofit is being written or talked about, you can use this to your advantage. A good article or even a TV segment can do a lot to boost your professionalism and create more buzz. And when it comes to helping you reach goals, more buzz is always good. Whether you have one small article or 12 big ones – creating a page that is dedicated to this content alone is just good sense. And of course, it’s easy, too. WordPress is natively a Blogging platform. Keeping an active blog is an amazing way to increase engagement and create a following. What’s even better, blogs are often referred to by other blogs and even news sites. This can up the possibility of increasing your site’s traffic and exposure. And it won’t hurt your SEO, either. Write about all the things that involve your mission – it’s a great platform for informing a wider range of people and spreading your important message. So, these are the things that you need to consider when building a Charity website in WordPress. I always suggest consulting an expert whenever you stuck on to something. WordSuccor is one of the leading WordPress development company that can give you the solution that you will be looking for. I hope my article will help you in the coming venture of your NGO. Till then have a great day ahead.